2010, North Carolina — Ok, not the best image of my wheel of life (the center is a tree, by the way). It was hard to hold the camera still! This labor of love is the medicine wheel I have come up for my back-pack/yoga trips that I have done a couple of in the past (in Yosemite). I plan to do another in September of this year (2012) in Big Sur, CA. To me, a medicine wheel is one’s orienting dharma, wheel, mandala — whatever you want to call it. We all stand in the center of our wheel with father sky above and mother earth below…from that center there is the wheel of life, the directions. Many say to begin in the East — the place of new beginnings and make your way around the wheel. Wheels can look very different. However, what is common are the directions, elements, animal spirits, and things to consider and be aware of at each stage. 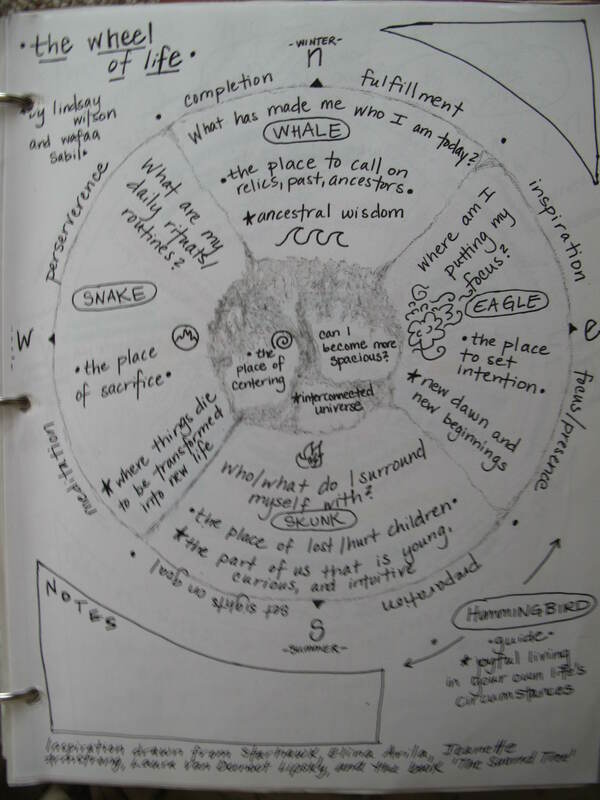 It is a developmental stage that is like a circle or a spiral…we come to the same places over and over again…and yet it is not quite the same. It is good to find the directions wherever you are. When I am in a new place, I remind myself to orient myself to the directions so that I know where I am on the planet. This practice offers not only orientation but it offers a relationship with where you are. It’s one simple thing you can do to orient yourself and connect with an ancient tradition of place-based knowledge. I also like to use the wheel as a reminder for the creative process. Like art, life is a creative process with ‘beginnings’ and ‘endings.’ The wheel reminds me of this so that I don’t get stuck with shoulds or could-have-beens. It is all a process. The best thing we can do is to fully step into the center of our dharma or our wheel and make good choices, acquire good life tools, and embrace the wholesomeness — the perfectly-imperfectness of life.